After a satisfying Restaurant Wars, in which Claudette was eliminated and our faith in the American justice system was momentarily restored, we are down to the final seven chefs. In celebration of their continued survival, they gather in the green room to sigh deeply. “These couches are going to get roomier and roomier,” Joe Flamm observes, darkly contemplating his mortality. Elimination: Eventually, it comes for everyone. Joe (mustache) takes comfort in his girlfriend. “You’re so handsome,” Bella coos, by telephone, and then Joe tells her how he was feeling burnt out, so he switched up his crystal configurations. “Crystals carry energy with them,” he explains, with an admirable semblance of conviction. “My girlfriend is a huge believer in this, and I’m definitely a superstitious person.” I try to think if I know anyone who would arrange crystals if I told them to. I think the answer is no. For tonight’s Quickfire Challenge, everyone has to make a dish using flowers that will impress guest judge David Kinch. “It’s about finding a balance between beauty and flavor,” he advises, profoundly. There’s more: It’s a Sudden Death Quickfire, so the bottom three must fight to the death, suddenly. “This is just not my thing,” moans Bruce, who is making floral bucatini because they are his “spirit noodle.” What is your spirit noodle, I wonder? Mine is Wagon Wheels. Carrie makes a Denver specialty called “Fancy Toast,” which is toast that is fancy. “Toast? Why would you make toast for David Kinch?” gasps Joe (mustache), who knows all about flowers, because of his girlfriend. He’s going to turn some squash blossoms in dumplings, but the twist is that he’s going to poach them instead of fry them, because that’s the kind of iconoclast he is. What Joe (mustache) did not see coming is that David Kinch loves a fancy toast. “It walks a nice fine line between sweet and savory,” he decides, and Carrie glows, which is her perpetual state. The toast takes it! Carrie is really coming into her own on this show; you might even say she is blossoming. In keeping with the theme of the evening, the death match will be a Cauliflower-versus-Cauliflower cook-off, featuring Cauliflower. “Cauliflower is something that’s usually overlooked,” philosophizes Tom, in front of a menagerie of cauliflower. “But lately, it’s making a huge comeback!” Since the best thing you can do with cauliflower is pretend that it is something else, the challenge is to substitute cauliflower for not-cauliflower. “Good job, everybody!” cheers Carrie, as the trio presents their bouquet of cauliflowers. Unfortunately, she is incorrect: Nobody did a good job. It is all terrible. “Considering how much is on the line right now, I’m disappointed in all of these dishes,” Tom sighs, paternally. He votes to give Joe Sasto the ax — the texture of the smoked-fried buffalo non-wings was “very off-putting” — but then David Kinch says Joe Flamm’s non-risotto was even more off-putting and obviously tasted like cauliflower, because it was. It comes down to Padma. Joe Flamm is out. She is sorry. Joe Flamm is also sorry. “I just feel like I abandoned my crew,” he reflects, with bearish charm for which he is known. “I’m going to do whatever it takes to get back in this competition.” It is the saddest breakup; in solidarity, I will continue to not eat cauliflower rice. “Okay,” sighs Padma. “Who’s ready to kick off the next challenge?” Nobody, but off we go! Do you know the Super Bowl is happening? It is! 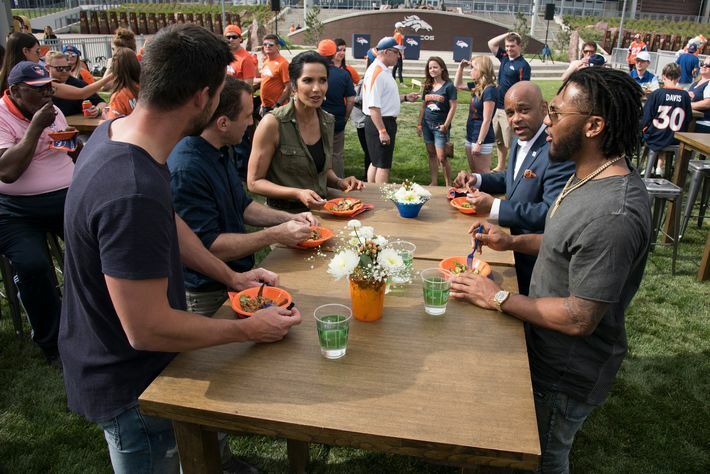 Since the Denver Broncos is also a football team, the Elimination Challenge is to “host the best tailgating party that Mile High has ever seen.” (Mile High is a stadium for football.) 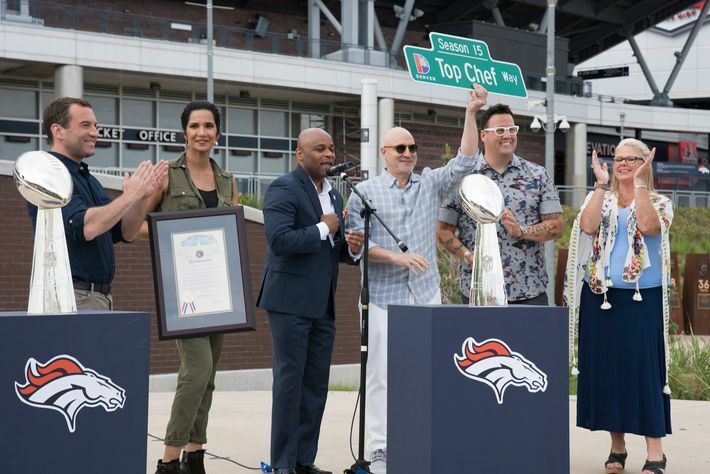 The chefs will work in teams of two to prepare a tailgate-y dish for 300 Broncos fans, and also some Broncos, and the mayor of Denver, while we’re at it. Everyone’s invited! Back in the kitchen, Tom has a couple of questions: Why are Bruce and Fatima making separate and unrelated dishes? Why doesn’t this poutine have cheese curds? Why is Joe Sasto still here? Just the usual things we all think about when we can’t sleep at night. And it’s game day! 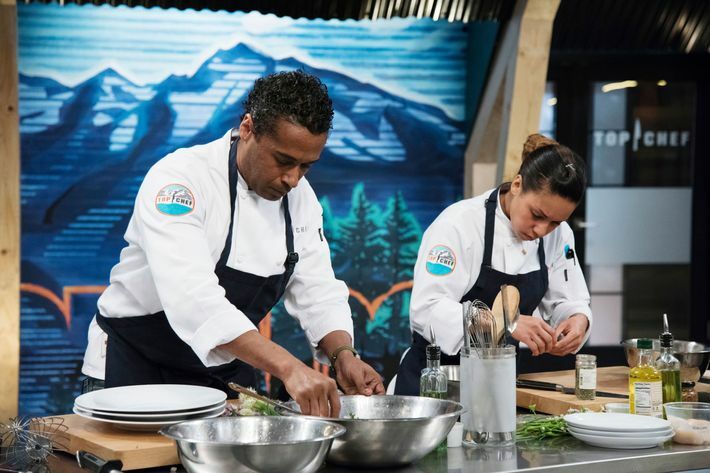 As the chefs put the finishing touches on their dishes, Adrienne worries that their crispy mac-and-cheese cubes aren’t actually crispy at all. To set the atmosphere, the sky turns a haunting shade of gray. 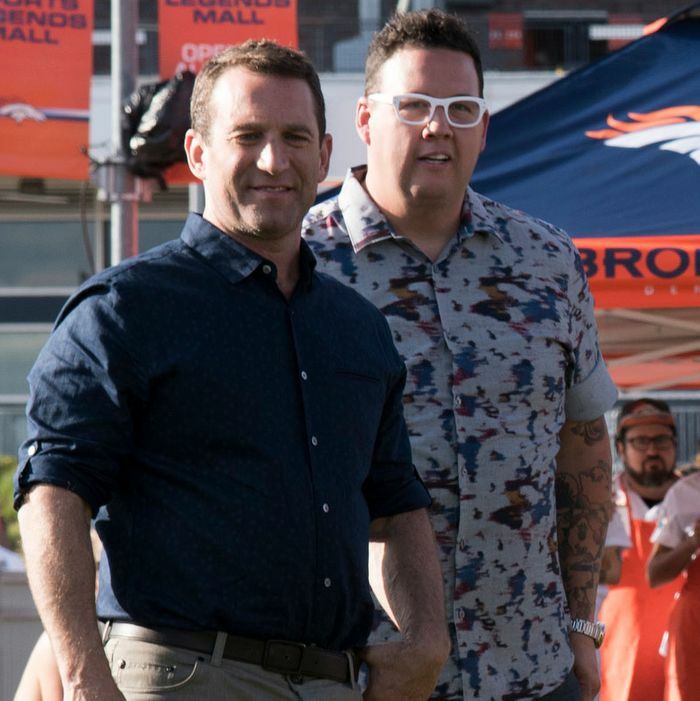 Then Mayor Michael B. Hancock of Denver declares it “Top Chef Day in Denver, Colorado!” and a bunch of adult men in fuzzy horse suits cheer wildly. Also, many actual Denver Broncos. Additionally, Carrie’s old boss, Jennifer Jasinski of Rioja is here! I am increasingly concerned that they are going to run out of people in Denver. Everyone likes Carrie and Chris’s alleged poutine. “Each chili gives a flavor,” raves Graham Elliot, who, like the wind, has appeared without warning. “They’re not just hot.” Tom agrees that they have flavor, and Jennifer says that they’re very Denver. “I give them a pass,” says Bradley Roby, a Bronco. The highest praise there is! Bruce and Fatima’s dishes are a little confusing, in that there are two of them, and the nachos are “a little muddled.” Adam Perry Lang liked the way they give “a diversity to the plate,” but was “looking for a bit of cohesion,” and really, isn’t that all any of us are looking for? Meanwhile, it turns out that Adrienne’s ribs are totally fine — not great, but they’ll do — but the mac is a soggy disaster. “If you’re going to fry mac, it has to be crispy, otherwise, why bother?” Tom points out, astutely. In his professional opinion, the mayor of Denver liked the coleslaw. “Everything was great!” announces Padma, when the judges reconvene. Everything? Tom is not convinced. “Here’s my thinking on this,” he says. “We’re in the fourth quarter here; there’s six contestants; there’s a lot on the line here. I don’t see a Super Bowl champion. I don’t see someone who’s really going for it.” The real winner here tonight is, as it is every year, Tom. At the judge’s table, Tom says the food was what he’d expect to get “at any tailgate party, without professional chefs cooking,” and he is again disappointed in everyone. Still, Carrie and Chris were clearly the best of the lot, so they’re the winners. Then Tom lays out the bad news, which is everything else. “If you’re going to make a version of something, it’s got to be the best version,” says Tom, but Fatima’s nachos were not the best nachos. They weren’t even good nachos. Adrienne’s ribs lacked intensity. The mac-and-cheese was soggy. The coleslaw was heavy. Since Bruce’s steak was fine, and Adrienne’s ribs were ribs, it’s between Fatima and Joe. “The question is, of these two really bad things, who’s going home?” muses Tom, who points out that the chicken in Fatima’s nachos was actually great, while Joe’s mac had no redeeming characteristics. But is it really fair to penalize Joe for the mac, since it was a collaboration, wonders interloper Graham Elliot? It is like watching a plane crash in slow motion. Fatima is out. Padma buries her head in her hands. Tom blinks miserably. I take back everything I said about faith, and the justice system. The future is bleak. I need to go rearrange my crystals.